Mullingar Presbyterian Church meets every Sunday at 11.30am. You'll find us at Raithin, opposite Educate Together National School. 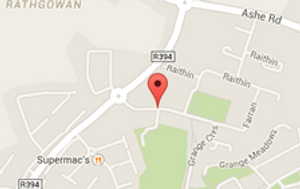 We're pretty much accessible from anywhere in Ireland! Heading out of town via Dominick Street once over the Green Bridge go right. At the roundabout ignore Penney'sCar Park entrance and take next road, travelling out past the Army Barracks and Tesco. At the Ballynacarrigy Road roundabout, go left. At the next roundabout go left. The road entrance into Mullingar Presbyterian Church will very soon be on your left - opposite Educate Togther National School - the church is visible - which is a nice way of saying that you can't miss it! Come off the N4 into Mullingar at EXIT 17 (signposted Castlepollard), take a left at the top of the slip road, on to the R394. Continue along R394 until you come to the roundabout at the hospital - go straight on. Continue on through 2 more roundabouts - at the 3rd roundabout take 1st exit - ie left. Come off the N4 into Mullingar at EXIT 17 (signposted Castlepollard), take a right at the top of the slip road, on to the R394. Continue along R394 until you come to the roundabout at the hospital - go straight on. Continue on through 2 more roundabouts - at the 3rd roundabout take 1st exit - ie left. Come off the N52 & on to the N4, signposted to Sligo. At EXIT 17 leave the N4 into Mullingar (signposted Castlepollard), take a left at the top of the slip road, on to the R394. Continue along R394 until you come to the roundabout at the hospital - go straight on. Continue on through 2 more roundabouts - at the 3rd roundabout take 1st exit - ie left. Just after the Park Hotel on the outskirts of Mullingar take the sliproad left on to the N4 Dublin - Sligo road. Come off at EXIT 17 (signposted Castlepollard), take a left at the top of the slip road, on to the R394. Continue along R394 until you come to the roundabout at the hospital - go straight on. Continue on through 2 more roundabouts - at the 3rd roundabout take 1st exit - ie left.